As I've learned more and immersed myself in the life of an athlete, my relationship with food has continued to evolve. A while back, I wrote a post on my nutrition philosophy, and while it still holds true that I view food as fuel for performance, I have also started to think more seriously about timing of nutrition in order to optimize performance and recovery. There is a lot of interesting discussion out there on what athletes should eat and when. Another consideration that has really caught my attention is the varying needs of women versus men, and how nutrients affect women's performance and recovery at various points in their menstrual cycle. (Sorry if talking about this makes you cringe guys...). Anyways, Osmo Nutrition opened my eyes to all of this, because Dr. Stacy Sims, Osmo's founder, has done considerable research on the affects of nutrition and hydration on female athletes. As the motto of Osmo goes... "Women are not small men." Apparently, recovery nutrition is even more critical for female athletes, as progesterone and estrogen inhibit muscle repair and glycogen restoration. To address that reality, Osmo created a women's protein powder for use within 30 minutes of your workout. 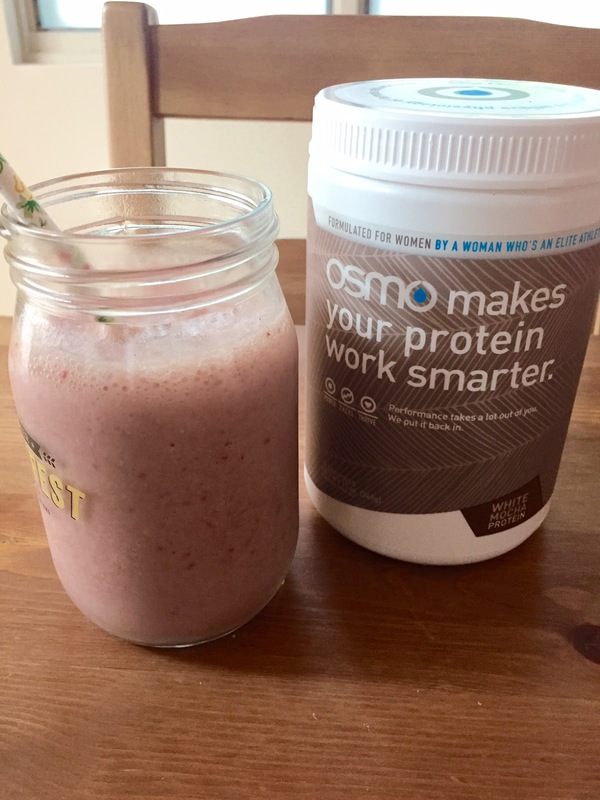 For my time trial Tuesday this week, I put water and ice in a blender bottle and packed my tub of Osmo protein. After the time trial, I added a scoop, shook it up, and I was in business. I knew I wouldn't be home within 30 minutes of my workout, and it was an easy way to help along my recovery from the TT. Us gals need a mix of protein and carbohydrates post-workout and with 20g of protein per scoop, this little smoothie delivers a healthy recovery punch immediately post-workout. Follow it up within 2 hours with a complete meal. When we fuel our body, pre- and post-workout with nutritious and delicious foods, we help to optimize our training and racing performance and recovery.